Even if I hadn’t been lucky enough to use one of the exact same training videos, I was at least fortunate enough to be trying to detect one of the 1000 objects that this model included (entry 355 from 0 to 999). Next I wondered if I could switch a pre-recorded video for live camera input, via getUserMedia. At first, it didn’t work, giving me the error: “Requested texture size [0x0] is invalid”. I wondered at first if it was an intentional restriction. Thankfully, the solution was simply to set the ‘width’ and ‘height’ attributes on the video element. 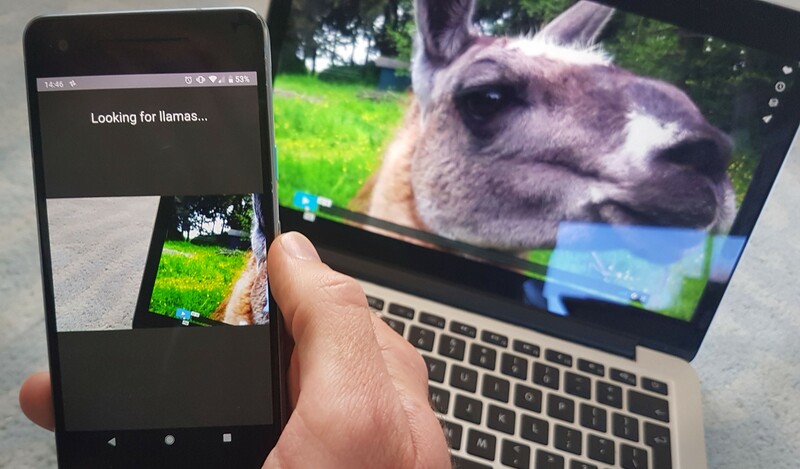 I pointed the camera at a picture of a llama on my screen (as I didn’t have a real llama to hand 😞)… And it worked! One thing to note is that in Android browsers I’ve tried other than Chrome, Tensorflow.js is giving a warning “Extension WEBGLlosecontext not supported on this browser” and the model takes a long time to load and calculate (I guess because it fails to use WebGL for better performance). Hopefully I’ll come across a solution for this soon. And one day I hope to make it to a llama farm — so I can test it out in real life! By Peter O’Shaughnessy on November 1, 2018.